"Medical Microbiology and Infection at a Glance" is a concise and accessible guide to the field of microbiology and infection. Updated throughout, the second edition takes the reader through the underlying concepts of microbiology to the pathogenesis, transmission and clinical management of infection and disease. Following the now classic 'At a Glance' format, topics are discussed on double page spreads. On one page, helpful memorable diagrams illustrate vital points and on the accompanying page, the text presents key facts and fundamental information. Starting with structure and classification, section one covers the transmission, investigations, therapy and control of infections. 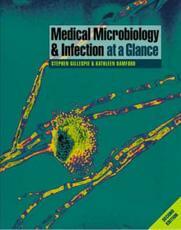 Section two and three cover the vital details of bacteriology and virology respectively. The final three sections include essential coverage of mycology, parasitology and systemic infection. The second edition includes three new chapters, which cover the use of antibiotics and treatment guidelines; vaccination and emerging infections as well as a new chapter increasing the coverage of Enteric Gram-negative bacteria. The second edition of "Medical Microbiology and Infection at a Glance" is an ideal resource for medical and biomedical science students, whilst students of other health professions and those in areas such as infection control will also find it invaluable. This book fits into the budget and reading time of busy students, and is recommended as primary or supplementary reading for a lecture-based course, and/or as a book for revision prior to examinations.